Superstar Nora Aunor was one of the celebrities who participated in Eat Bulaga’s hit segment “Jackpot En Poy” today, March 11. Other contestants on GMA-7's noontime TV show were billiards king Efren “Bata” Reyes, photographer Raymund Isaac, and newscaster Ivan Mayrina. 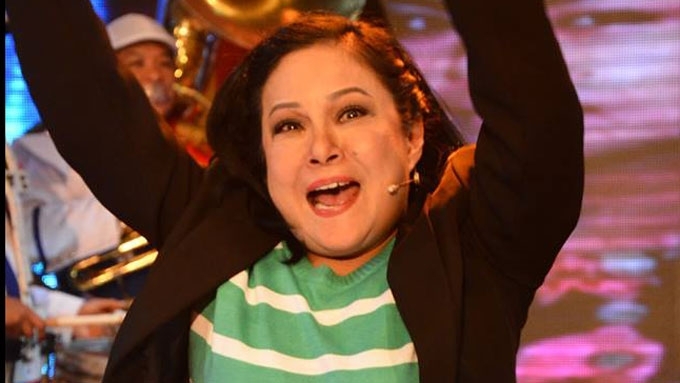 Introduced by Joey de Leon as the “nag-iisang superstar,” Nora went on stage sporting a green and white striped blouse, dark blazer and trousers. She beat Ivan Mayrina in the first round (3-0) then Efren Reyes in the second round (3-2). Jose Manalo, playing “Kap Lloyd,” acted as the referee. However, Nora wasn’t able to win at the jackpot round where she lost against Starry Potter Ryan (Ryan Agoncillo), Little Sister Ryzza (Ryzza Cenon), and Starzan Alden (Alden Richards). Nora was supposed to be one of the judges in today’s grand finals of “Tawag ng Tanghalan” contest in It’s Showtime. However, she backed out after telling writer Mercy Lejarde, “Nag-back out ako dahil hindi ko kaya si Vice Ganda. Hindi kaya ng puso ko ang pambabastos na ginawa sa akin ni Vice Ganda." Vice Ganda has so far remained mum about the issue. Nora credits Tito Sotto for helping her family during the illness and death of her brother Eddie Villamayor.